Don’t you just love it when you hit it off instantly with a stranger. While working with Alex, I just felt this bond of friendship building. For an relatively introverted person (such as myself) it is a rare thing to feel so immensely comfortable with someone else so quickly. By the end of Scott’s newborn boy session, I felt that we could be the best of friends with very little effort at all! So, needless to say, it was a definitely pleasure working with Alex & her family. Sweet little newborn boy, Scott, played a big part in my enjoyment of the day as well. After being wide awake and squirmy at the start, he fell into a nice deep sleep and let me play! My very favorite kind of newborn session! While planning this newborn boy session, Alex mentioned that they had kind of a navy blue & red camping adventure feel in his nursery. So, of course, the prop junkie that I am, jumped on etsy and ordered a navy blue & plaid jumpsuit with matching hat & pillow! I couldn’t help myself, it was just too perfect for this session! And hopefully, I will get a lot of use with this in other newborn boy sessions too! And then, of course, I had to do the bear hat to go with his camping themed room! 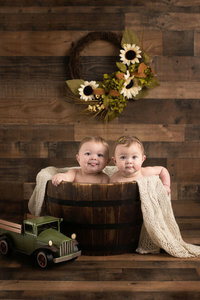 His sister had to have been the sweetest two year old to ever grace my studio! She had as much patience as a kid more than twice her age, and the very best faces & sweetest smiles. There are a trio of pictures that I took while she was “holding” him, and their faces matched up in each & every one of them. There can be no doubt that they are siblings though & through! I mean, seriously, how is this even possible!?! Plus, of course, the rest of the adorable family (and my new best friend – even if she doesn’t know it yet).